After what feels like many months of rumours, leaks and speculation, the Pixel 3 is finally official and available to buy. It comes almost exactly a month after Apple took the wrappers off its flagship iPhone XS handset – so which of these premium phones is best? We can't spend your money for you, but we can compare these two handsets in all the areas that matter, including their designs, their internal configurations, and the features they bring with them (such as wireless charging). Read on to get all the details you need. 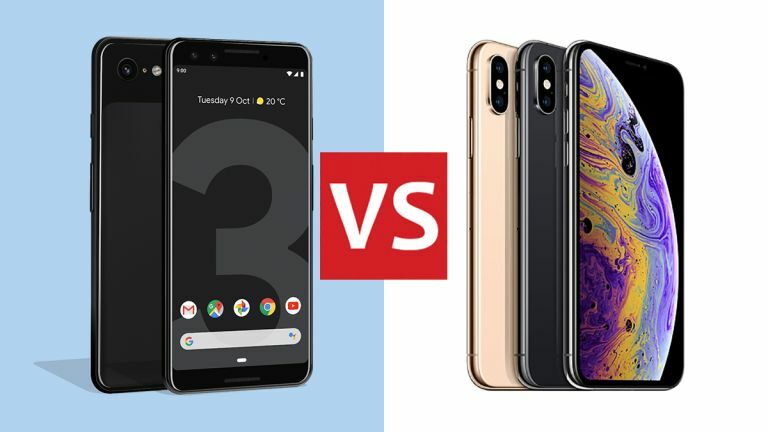 We've definitely got two lookers on our hands here: both Apple and Google have excelled themselves in terms of the design of the Pixel 3 and the iPhone XS, though neither phone differs too much from the respective templates laid down in 2017. It's hard to split these phones in terms of their aesthetics. The Pixel 3 is made from an aluminium frame, with glass front and back – thanks to a special etching technique, Google has managed to retain that Pixel-esque two-tone effect on the front and back. The OLED screen measures 5.5 inches corner to corner, has a resolution of 1080 x 2160 pixels, and comes without a notch. You can pick it up in black, white or pink-ish. The iPhone XS also features a glass front and back, but has a stainless steel edging. The 5.8-inch OLED display has a resolution of 1125 x 2436 pixels, and of course it comes with the display notch that the iPhone X made iconic. In this case your colour choices are space grey, silver and gold. It's a little shorter and a little wider than the Pixel 3. Both these phones are packed with the latest and greatest smartphone components. We suspect the A12 Bionic processor inside the iPhone XS might just have the edge over the Snapdragon 845 inside the Pixel 3 in terms of raw power, though you're unlikely to really notice the difference unless you're running benchmarks. Both phones bring 4GB of RAM with them, but the iPhone XS has more storage options: 64GB, 256GB or 512GB, as opposed to the 64GB and 128GB configurations of the Pixel 3. Neither phone lets you expand the storage with a memory card – Apple and Google would rather you bought some cloud storage space off them. In terms of rear cameras, we've got a single-lens 12.2 MP, f/1.8 snapper on the Pixel 3, and a dual-lens 12 MP, f/1.8 + 12 MP, f/2.4 camera on the iPhone XS. On paper that puts the iPhone ahead, but last year Google made up the difference with its smart image processing algorithms done on the software side – and it looks like it's pulled off the same trick with the Pixel 3. Speaking of taking photos, these phones are packed with camera features like portrait mode and an adjustable depth of field even after you've taken pictures. The Pixel 3 probably just edges it with its plethora of AI-powered features: Top Shot (for taking the best shots), Super Res Zoom (for better zooming) and Night Sight (for getting the best pictures in low-light conditions without flash). Elsewhere the Pixel phones have added wireless charging this year, so that's another difference between the two ranges gone. Both phones have IP68 water and dust protection too, so they'll both survive a relatively brief dunk in your liquid of choice. As you can see, there's not all that much to choose between them. At this point we should bring up the usual Android vs iOS issue – iPhones only play well with other Apple hardware, whereas Android phones play well with pretty much everything out there, from Windows 10 to Chrome OS. That means one of these phones might work much better with your existing hardware than the other one does. It's now more than ten years since the original iPhone came out, and we're now at the stage where there's very little to choose between the best smartphones: they're all very fast, they all work very intuitively, and they all take great photos in almost any kind of lighting condition you want to try. With that in mind, your choice between the Pixel 3 and iPhone XS may well come down to whether you prefer Android or iOS – a decision you may well have made a long time ago. Perhaps even more pertinently, your choice might come down to how heavily you've invested in the ecosystems of Google or Apple; with the hardware now so advanced across the board, it's the little software differences that count. It goes without saying though that these are two very, very good smartphones – two of the best of the year – and they'll both serve you well for years. One factor we haven't mentioned yet is price, which might sway you one way or the other: the Pixel 3 starts for £260/$200 less than the iPhone XS.